ATHENS, Ga. (AP) — Georgia tailback Isaiah Crowell was dismissed from the team Friday by coach Mark Richt after the sophomore was arrested on felony weapons charges. Police found a gun in Crowell’s vehicle early Friday morning. Georgia announced the dismissal Friday afternoon. Richt’s short statement in the announcement did not mention Crowell. Crowell was arrested at a vehicle checkpoint on the Georgia campus at around 2:20 a.m., according to Athens-Clarke Police Department spokeswoman Hilda Sorrow. Among the charges he faces are carrying a concealed weapon and possession of a weapon on school property. Crowell consented to a search after officers smelled marijuana in the vehicle. Police found a 9-millimeter Luger pistol under the driver’s seat with an altered serial number. Crowell was released on bond Friday afternoon. As a freshman in 2011, Crowell led Georgia with 850 yards rushing. 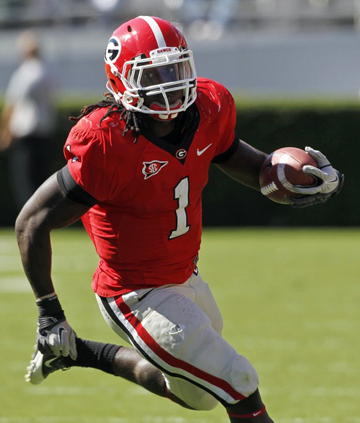 Crowell, 19, came to UGA in 2011 as the top-rated running back prospect in the country out of Carver High School in Columbus, Ga. He announced he would attend Georgia by pulling out a bulldog puppy at signing day news conference. He went on to win Southeastern Conference Freshman of the Year honors from The Associated Press. Crowell rushed for a career high 147 yards on 30 carries to help the Georgia beat Ole Miss 27-13 last season. He eclipsed the 100-yard rushing mark on four occasions, and scored six touchdowns. Despite his success, Crowell’s freshman season also included setbacks on the field and off. He and two of his teammates were suspended for one game and missed Georgia’s game against New Mexico State after they failed a drug test. In the SEC championship game, he struggled with 10 carries for 15 yards in a 42-10 loss to LSU. Crowell’s exit will open the path for two highly rated newcomers to the team to play as freshmen. Tailbacks Keith Marshall of Raleigh, N.C. and Todd Gurley of Tarboro, N.C., were two of the top players in Richt’s 2012 signing class. Ken Malcome, Brandon Harton and fullback/tailback Richard Samuel are left as the top returning rushers. Marshall was third, behind Malcome and Crowell, on Georgia's tailback depth chart released after spring practice.